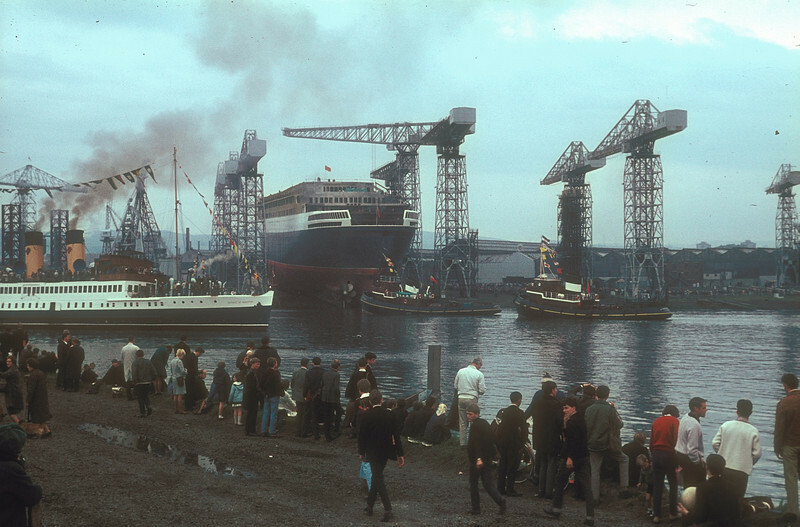 The Cunard liner RMS Queen Elizabeth 2, the most famous ship in the World, was launched from the shipyard of John Brown & Company at Clydebank, Scotland on 20th September 1967. Some of the first group of photographs in this set are from a remarkable collection taken by the late Mr William Davies of Glasgow in September 1967. It was almost 21 years after the new ship departed from the Clyde before she returned to the Clyde (in 1990). She returned on a few other occasions and, in 2007, forty years after her launch, the ship returned to Greenock Ocean Terminal on the Clyde on 20th September 2007 to celebrate the anniversary. After a gala day of events, including a 40th Birthday Fly-past Salute by the Red Arrows, the ship departed from Greenock at 18:00 hours. Many thousands of Clydesiders gathered to watch the last of the classic Clydebuilt liners depart. A set of images were taken from a vantage point aboard the veteran motor ship Balmoral which escorted theliner from Greenock to Innellan. 20th September 2007. Just over a year after her 40th anniversary vist to the Clyde, the liner returned to the river of her creation for the very last time as a few weeks later she made her last ever voyage, to the city of Dubai where she was to be converted to a static luxury hotel. Despite extremely poor weather through the majority of the summer of 2008 on the Clyde, the day of the last great Clydebuilt liner's final visit was a miraculously fine autumn day and tens of thousands of people lined the shores of the Firth of Clyde, aware that another chapter in the long maritime history of the Clyde was about to end. Some of the return visit pictures are by Tom Dunlop. The well known Clyde turbine steamer Duchess of Hamilton, flagship of the Clyde fleet, under the command of the legendary Captain Fergus B Murdoch MBE, passing the new liner as she arrives from downriver for the launch – she berthed in Rothesay Dock.